I have three 23" Samsung LCD monitors, and I've had all three hooked up to my MacBook Pro, for a total of four displays. Problem is, the MacBook Pro's Retina display has totally spoiled me. The Samsungs now look terrible in comparison, so much so that I stick to the single MacBook Pro display as much as possible, until I have to go to multiple monitors for whatever task I'm working on (I'm a Java software engineer). I got to thinking if it's possible to use an iPad with Retina display as an external monitor. Even better, if I could just buy iPad display replacement parts and use those as external monitors, that'd be rad, but I don't know (a) if it's possible, and (b) what kind of connector they would require. How can I directly connect two iPads or two standalone iPad Retina displays to my MacBook Pro? 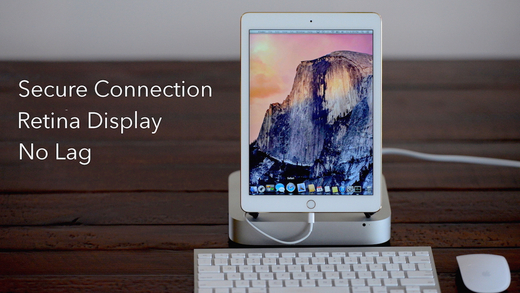 The app Duet Display lets iOS devices connect to a Mac that is running at least OS 10.9. The Mac needs duet software which is a free download and connects via Lightning port to the Mac in question to send the video. The Mac app is a free download and the iOS app is available for purchase on the iOS App Store. There are a few Apps on the App Store that will allow your iPad to be used as an external display using your WiFi connection. It would definitely not be possible to connect an iPad to the MacBook without an app designed to do that on the iPad and a daemon on your MacBook, and it would have to use some tricky protocol passing data through the Lightning connector as audio (or some other way that the app could access). There is no way to connect to an iOS device by Thunderbolt that I know of. Connecting just the iPad display to the computer would be as close to impossible as to make it unfeasible. The displays in iOS devices use the DSI protocol, so would need custom-made circuit boars for the connectors, and custom low-level drivers to interface with the GPU, and the OS. The only truly high-DPI (>120) monitors that I've seen are for medical applications (e.g. this one), and they only give quotes when you contact them. So for the moment, Wifi display apps such as Air Display are the best solution for Retina displays. Or, the Apple Thunderbolt Display has one of the highest DPIs of consumer-grade monitors, at 109 DPI, but this is still a far cry from the 227 DPI of my 13-inch Retina MacBook Pro. If you can't solder, then it's a useful skill if you do any electronics. However, this project isn't much of a beginner project. If you can't, do you have a friend who thinks they can do it? The post has the schematics and the instructions. Read to see if you think you can attempt it. A couple of things: it isn't touchscreen, you would have to build a case for it, and it may have some glare and not look as glossy as a real iPad screen does. For the last problem I mentioned, you might be able to ask a question in the comments about how it looks before you buy anything. The author says that the pictures look nothing like the real thing, but it never hurts to ask. You don't want to get stuck with a monitor that the screen looks old at a glance (one of those that has lots of glare and looks kind of flimsy), even if it is high resolution. I don't know if Apple adds a layer to make it look high quality. It only supports DisplayPort as an input. Depending on your setup, this may be a problem. However, at only $70 per monitor, you can afford a few extra cables and adapters. Another app that connects the iPad or multiple iPads as external displays over local wi-fi, iDisplay. And in several modes as well, as Additional Display, Shared Display etc. It works well for my iPad mini with Retina display. I've tried to use iDisplay, but soon after purchasing it I suddenly discovered it doesn't support retina displays. Not the answer you're looking for? Browse other questions tagged display macbook ipad .